Honda's advanced inverter technology provides 3000-watt of extremely quiet, clean and fuel-efficient power. The eu3000is handi can operate a wide variety of appliances, making it perfect for use at home or camping. Exceptionally efficient, it can run up to 7.7 hours on a single tankful of gasoline, depending on the load. And best of all, it's extremely portable with its standard folding handle and wheel kit. Tbook.com crawls the web to find the best prices and availability on Generators and related Tools and Hardware products like Honda 3000-Watt Super Quiet Gasoline Powered Wheeled Portable Inverter Generator with Eco-Throttle and Folding.... For this page, related items include products we find that match the following keywords: "Generator GENERATOR" at our vendor partner Home Depot. 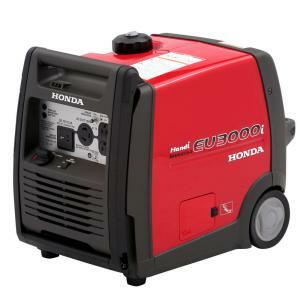 Honda 3000-Watt Super Quiet Gasoline Powered Wheeled Portable Inverter Generator with Eco-Throttle and Folding... is one of 152 Generators and related products listed in the Tools and Hardware section of Tbook.com If you have any questions on this product, please give us a call at 734-971-1210 during the hours of 9am - 5pm EST for assistance. Thank you for shopping at Tbook.com, the Internet Department Store!